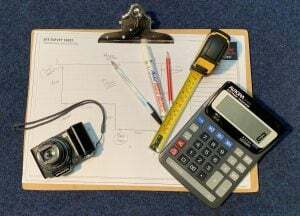 Home » Blog » EASY GUIDE TO MEASURING YOUR PROJECT AREA! How to measure your balustrade project area? The process of measuring your area for installing a glass balustrades is not as hard as it initially may appear. By following these easy to follow steps you will successfully take accurate measurements that will allow you to obtain an idea of cost. We have also added some additional tips that will enable our team at Elite Balustrade understand your project better and enable us to suggest the best design solutions for your project needs. Key to getting all the right information is to Take your time and Preparation – possibly the most important factor in getting your calculations right is to take your time, and double and triple check your measurements and so on. By following these tips you will hopefully prevent yourself ordering a system that is a fraction too big or too short. Gather your measuring tools and equipment – you will need pen, paper, chalk and a tape measure. Also get someone to work with you to assist with taking the measurements. If you have a fall on your platform it may be worth having a length of string / cord and a spirit level. By having a second pair of eyes present you can ask them to check over the measurements taken. This way, one person can focus on getting the measurements and the other on taking notes. Draw a plan – we always suggest starting with a drawing of where you want the glass balustrade system to be situated. 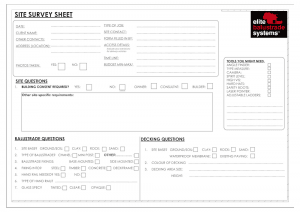 Click Here to download a printable plan template that will assist with collating your information. You do not need to create a complex drawing, nor does it have to be to scale but by drawing out exactly where you want it, you can add measurements to a plan. By doing this you can also identify where there may be some awkward spots in your design. Don’t forget to include dimensions of supporting walls, doors, steps etc. Also show on the drawing where the outside of the platform is. Make a note of what the platform is made of (i.e. brick, stone, concrete, timber, deck etc..) and describe any other support structures that are relevant. What do I actually measure? At Elite Balustrade Systems we offer a bespoke balustrade design service. By following the guidance in below you will provide the team at Elite Balustrade enough information for us to do the complex calculations for working out fixing centres etc. Identify the outside edge of your platform – by measuring the outside of your platform area this is the most useful information Elite Balustrade need to help to look at the various options for a suitable balustrade. Different balustrade designs have different fixing centre requirements, so let us do the hard work and calculate the size of the required balustrade by using your outer platform dimensions. 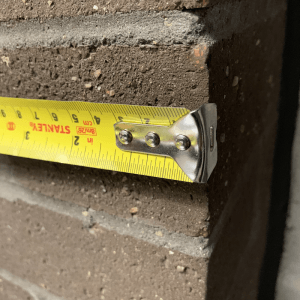 Parapet walls – if your project includes a parapet wall that will support the balustrade fittings, you will need to consider measuring the height and width of this too. Height – the height of a standard balustrade is 1,100mm. If you want a different height, you will need to make noted of your requirements so you can share these with us. Fall Measurement – if your platform is sloping this is the easiest way to measure the fall height. (1) Hold the string at the highest point of the fall. (2) The second person should hold the string at the end of the fall and pull tight. (3) Ask a third person to use the spirit level ask asking the second person to raise or lower the string until the string is level. (4) Measure the distance from the end of the string held by person 2 and ground. (5) Measure the total length of the string from Person 1 to Person 2. Record these two measurements as Rise (height) and Fall (length) so our team can work out the angle of your platforms fall. Measuring Tips – most tapes provide measurements in both metric (centimetres / millimetres) and Imperial (Inches). Ideally we work with metric but if you’re more confident in measuring in inches that is absolutely fine, we will do the conversions needed. If measuring up to a wall or post push the silver end of the tape up against this. The silver end of the tape will move but this is normal as this provides an accurate measure. If you are measuring at the end of the platform place the tape end over the platform and pull the tape tight when you measure. Again the end will move but this is normal. When using metric measurements your tape will show the number in centimetres. The small marks in-between these refer to millimetres. For instance 2cm and 6 small marks after is 26mm (2.6cm). Some tapes also show metre marks, so if you measure 1m 2cm and 6 small marks this is 1026mm (102.6cm). 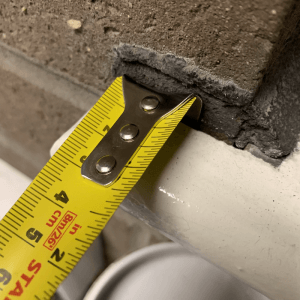 Record your measurement – make sure you have an accurate drawing, and against this clearly mark readable measurements for each of these measurements. Add notes that help to interpret the drawing and associated measurements. Take photos – as they say pictures tell a thousand words. Take pictures of the project area from various angles. This helps with interpreting the drawings accurately and identify any obstacles or complexities required for the balustrade design. This also shows clearly what the balustrade is being fixed to and will help in choosing the correct design for your project. You can email it to us so that we can provide you with a quote for the system that you require. It is worth double and triple checking measurements as we cannot be held responsible for shortfalls or over-shoots that you have measured.